This vintage pen is a 1955 Meisterstück 149 piston-filler in Celluloid. This was an early production model, while Montblanc pens were still being hand made by master machinists (prior to the introduction of injection molded ‘Precious Resin’). Outer two cap bands are sterling silver, otherwise gold-filled trim. Visualated barrel window with perfect vertical lines. Three-tone 18C nib, rarer than 14C. Even rarer is that this one is medium, FLEXIBLE. Near mint+. Item #5 in Catalog #84. 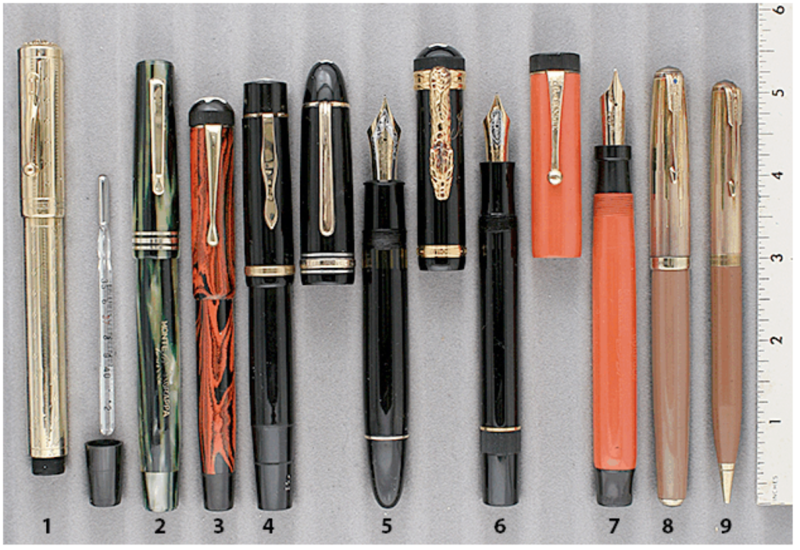 This entry was posted in Vintage Pen, Vintage Pens and tagged Catalog, Catalogs, Celluloid, Extraordinary Pens, Flex, Flex Nib, Flex Nibs, Fountain Pens, Go Pens, GoPens, Montblanc, Vintage Fountain Pen, Vintage Fountain Pens, Vintage Montblanc, Vintage Pen, Vintage Pens. Bookmark the permalink. Follow any comments here with the RSS feed for this post. Post a comment or leave a trackback: Trackback URL.